You will see from this that, by this saving Swallow, I am thinking of the ascended Lord Jesus Christ. Has He not said of Himself that He is the Way? Did He not Himself say to His Apostles: “I go to prepare a place for you...and if I go...I will receive you unto Myself” (St. John 14:2–3)? And did He not say to them before this: “And I, if I be lifted up from the earth, will draw all men unto Me” (St. John 12:32)? This that He Himself said began to be fulfilled a few weeks later, and has continued to be fulfilled right down to our own day, and shall be to the end of time. That is, being the beginning of the first creation of the world, He became also the beginning of the second creation, or the blessed renewing of the old. Sin clipped Adamʼs wings and those of all his descendants, and they all fell away from God, went off, and were blinded with the dust from which their bodies were created. Christ, as the New Adam, the first Man, the Firstborn among men, was the first to rise up to Heaven on spiritual wings, to the throne of Eternal Glory and power, thus cleaving the way to Heaven and opening all Heavenʼs gates to His followers, with their spiritual wings — as an eagle cleaves the way for its eaglets,as the swallow which goes ahead, showing the flock the way and breaking the airʼs heavy resistance. “O that I had wings like a dove; for then would I flee away and be at rest” (Psalm 54 :6), the Psalmist cried in distress before Christʼs coming. Why? He himself explains: “My heart is disquieted within me, and the fear of death is fallen upon me. Fearfulness and trembling are come upon me, and an horrible dread hath overwhelmed me” (vv. 4–5). Such a terrible sense of deathly fear and of the horror of existence in the wastes of this life must, like a heavy nightmare, have weighed on the whole rational, honest world before Christ. “Who would give me wings, to fly away from this life?”: this must be a question asked by many noble and sensitive souls. But whither will you fly, O sinful human soul? Can you still, as in a dream, feel that place of warmth and light from which you have been driven out? Lo, the gates were closed behind you, and Cherubim with flaming swords were placed there, to forbid your approach. Lo, sin has clipped your wings — not birdʼs wings but Divine wings — and has forced you firmly down to the ground. Someone is needed, first to free you from the weight of sin, to wash you and make you stand erect. And then someone is needed to implant and nourish new wings in you, so that you can fly. Then you need someone, someone very strong, for whom the Cherubim with flaming swords will stand aside, to let you through to your glorious homeland. Lastly, you need someone who will find mercy for you from your grieved Creator, so that He will receive you once more into the lands of His immortal country. This “someone” was unknown to the pre-Christian world. He revealed Himself as our Lord and Savior Jesus Christ, the Son of the living God. From love for you, He bowed down from Heaven to earth and came down on earth, clothed Himself in flesh, became a prisoner for the sake of you prisoners, suffered sweat and frost, endured hunger and thirst, gave His face to spitting and His body to be nailed to the Cross, lay in the tomb as a corpse, went down to Hades to destroy a prison worse than this life, that was intended for you after your parting from the body — and all this in order to save you from the mire of sin, and set you on your feet. He then rose from the dead, by this means to give you wings for flight to Heaven, and finally ascended into Heaven to open the way to you and bring you into the Angelsʼ abode. You do not now have to sigh in fear, trembling and horror as King David did, nor to desire wings like a dove, for the Eagle has appeared, and has shown and cloven a road through. You have only to nurture the spiritual wings that you were given at your Baptism in His name, and to desire with all your strength to climb up there where He ascended. He has done ninety-nine percent of all that is needed for your salvation; will you not strive to do that one remaining percentage point for your own salvation, and this when, for you, an entrance shall be ministered...abundantly into the everlasting Kingdom of our Lord and Savior Jesus Christ (II St. Peter 1:11)? 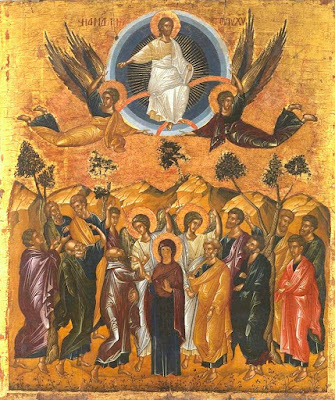 The Lordʼs Ascension from earth to Heaven is as unexpected to men as His coming down from Heaven to earth and His birth in the flesh was to the Angels. What event in His life does not represent something unique and uniquely unexpected to the world? As the Angels watched with wonder how God, at the first creation, separated light from darkness and water from dry land, how He placed the stars in the heavenly vault, and how He brought forth plants and animals from the dust and finally formed man, giving him a living soul, so each one of us must look with wonder at the events of the Saviorʼs life, beginning with the wondrous Annunciation to the most holy Virgin by the Archangel Gabriel in Nazareth, and then through in order to His mighty Ascension on the Mount of Olives. It is all, at first sight, unexpected, but, when they are made aware of the plan for the dispensation of our salvation, all rational men must shout for joy and glorify Godʼs power, His wisdom, and His love for mankind. You can take no single great event out of Christʼs life and not disfigure the whole, as you cannot cut off a living manʼs arm or leg and not disfigure him, or remove the moon from the heavenly vault or blot out a part of the starry myriads, and not disfigure the order and beauty of the heavens. So do not think of saying: “It was unnecessary for the Lord to ascend!” When some of the Jews were constrained to acknowledge and cry out: “He hath done all things well!” (Mark 7:37), how can we, who are Baptized in His name, not believe that all He did, He did well: devising and ordering with great wisdom. And His Ascension is therefore also good, devised and ordered with great wisdom, as are also His Incarnation, Baptism, Transfiguration and Resurrection. “It is expedient for you that I go away” (John 16:7), said the Lord to His disciples. Do you see how He disposes and does everything as is best for me? Every word and act of His have our good as their aim. His Ascension is of boundless good for us all. Were it not so, He would not have ascended. Source: [Nikolai (Velimirovich), Bishop of Ohrid, “Homily 27. The Ascension of the Lord,” in Homilies (Birmingham: Lazarica Press, 1996), Vol. I, pp. 296-299.